In spring time we want to lift our energy out of winter lethargy, increase circulation to flush out accumulated waste, and stimulate the immune and digestive systems. That’s why body cleansing and movement practices become even more important this time of year and can help us avoid spring sniffles and shed unwanted winter weight. We want to focus particularly on morning routines because how we start our day is how we live our day, and it strongly influences metabolism and immune function. Staring the morning with an invigorating exercise routine and few simple cleansing practices can make all the difference to transition through spring with ease. Below you’ll find a go-to spring morning routine as well as recommended yoga poses. Tongue Scrape — Do this first thing when you wake up to remove excess mucus and simulate digestion. Hydrate — To support lymphatic flow and digestion. Try warm water with lemon or apple cider vinegar. Exercise — Anything to get the heart rate up and blood flowing like yoga, running, swimming, walking, dancing for 20 minutes. Dry brush — With exfoliating gloves vigorously brush over your whole body before a shower to stimulate lymph and immunity and bring a spring lustre to your skin. Nasal Flush — Cleanse your sinuses with warm salt water using either a nasal rinse bottle (found at any chemist) or a traditional Ayurvedic Netti Pot. improve circulation to the abdominal organs, essentially “wringing out” accumulated toxins and stimulating metabolism. Build heat in our body, burning up impurities and winter weight as well as lift our energy and motivate us into action. Bring the head below the heart improving circulation of blood throughout the body as well as increase fluid to lymph nodes around cheat and throat stimulating the immune system. The folding motion also squeezes the belly, which moves things along for digestion. Legs up the wall, shoulder stand or head stand uplift both body and mind. The reverse pull of gravity improves circulation through legs, creates movement through abdominal organs and invigorates the senses. Remember to practice these with caution or an experienced teacher. Move your body and lift your heart rate every morning for 20 minutes. Pick an exercise you’ll look forward to and enjoy and you’re more likely to stick to it. Hydrate before you caffeinate. Drink a glass of water for ever cup of coffee or tea. Once a week flush your sinuses especially if you’re experiencing allergies or congestion. 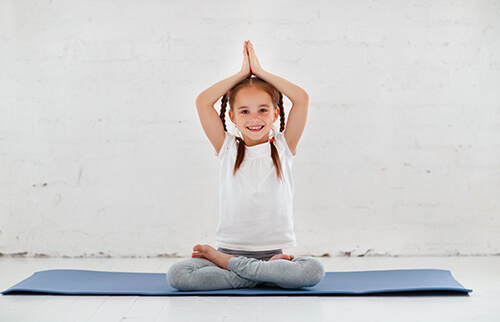 Get the kids moving with you in the morning by doing some simple yoga. It can be made playful and fun my imitating animals, and before you know it you’ve done twists, forward folds and got your heart rate up, plus the kids think you’re playing with them. Win win!